You may not know that we are music nuts. Not music lovers, music nuts. We are nuts about music. I used to work in music (retail, and then a couple of labels) and DJed for fun for quite a while. Over a period of about 10 years, both of us bought tons of CDs (often at nasty import prices) and trawled round the key shops on the day they got their deliveries to make sure we could get our hands on the rare produce. I still have 10 boxes of vinyl I don't quite know what to do with, and thousands - yes, thousands - of CDs. Nuts. 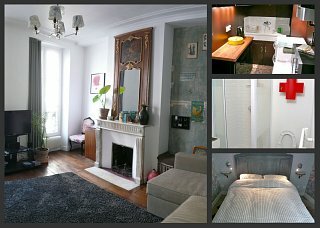 As we wanted the apartment to be more like a home than a room, music was always going to be part of the equation. As well as the selection of CDs we've left at your disposal, there are some special CD-Rs in a red binder that deserve your attention. The CD above is one of the most overlooked albums of the last ten years. 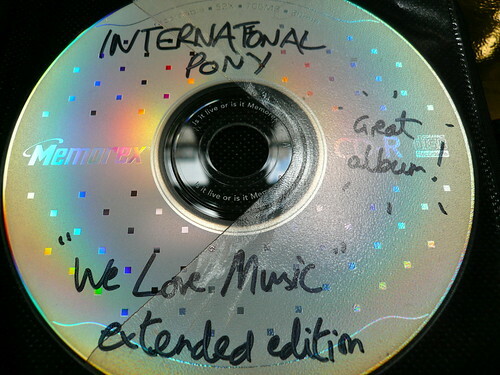 International Pony was a three-person German group (DJ Koze is still very much around, the others have more or less disappeared). They made one great album and one average one before dying off completely. We Love Music is a masterpiece that starts off very calm and lures you in before going all bananas towards the end. The CD we've provided for your listening pleasure is an extended version of the album with some b-sides and remixes added to the end. And it's all brilliant. Of course, we're not interested in just providing copies of stuff. We like to personalise things a bit more. Like the two CDs above: the one of the left is loads of great house and garage from the 90s that I've gleaned from various blogs (heard of Frankie Knuckles? David Morales? Steve "Silk" Hurley? If so, you might like this). It also includes several re-edits of tracks that I've done myself, so it's packed with exclusive versions. And not only that: it's an mp3 CD, so there 6 bloomin' hours of music on it! Some of it's divas, some of it dubs. I feel it dates from a time when music wasn't so darn boom boom boom all the time. The CD on the right is a compilation of DJ Yoda's cut 'n' paste albums. DJ Yoda is a brilliant, hilarious hip-hop DJ who doesn't take himself seriously, and his cut 'n' paste efforts have everything and the kitchen sink thrown into them. If you think you don't like hip-hop, you should listen to these. The RAVE! CD on the right is for when you just want some pounding, acid techno vibes. Of course we would never condone drug use, but if I ever took drugs this is definitely the CD I would listen to. Loud. Several times. There's a completely mad, unreleased James Holden remix of Britney Spears on there that you shouldn't miss (I kid you not). James Holden mixed one of the best/most surprising house/techno compilations of the last few years recently. You should buy it (very cheap here, for example). And on the left we start getting into the 5.1 zone. You know the apartment's kitted out for surround sound right? Well, I've found this site that make surround sound recordings available for download. Not strictly legal per se, but many of the albums are old quadrophonic vinyl mixes that don't exist any more. Take these two albums by Joni Mitchell for example. Beautiful stuff, and even more wonderful when you're sat on the sofa and the music's coming at you from all sides. What a shame fruity cigarettes are forbidden at the apartment eh? These are another couple of surround sound CDs that might get you all gloopy. I love a bit of Beck in surround sound, so the CD on the right is a mix of Sea Change and Guero. Surprising, if you've never heard them in surround sound. Sea Change is especially good for chilling out. As for Herb Alpert and Enoch Light (whom I'd previously never heard of), they'll deal you out some kitsch easy listening if you're in the mood for something completely bonkers. You will laugh, believe me. There's more coming of course. Any suggestions? We're always ready to listen to something new. * And if you're interested, I have my own music blog here: www.themixesandthedubs.com (mostly house and garage from the 90s). Otherwise I suggest the hype machine (a music blog aggregator) or last.fm for discovering new stuff. And by the way, we may have a few CD-Rs in the apartment, but believe me, whenever we come across something we love, we buy it. Make sure you do the same. *Current faves: DM Stith, Grizzly Bear, Ohbijou... Check 'em out.